Our range of products include mancozeb 75% wp. Packaging Size 100 gm - 1 kg. 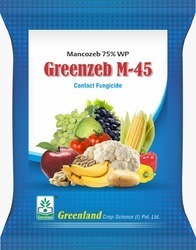 We are offering a quality assured collection of Mancozeb 75% WP Greenzeb M-45 that is mainly used as the foliar spray, besides as soil drench also. These products also control the various rusts, blights, and leaf spots Mildew Root. In addition to this, the offered product is inspected on parameters of quality to ensure its effectiveness and quality.